Throughout the centuries since its inception, photography has widely become a very important part of civilization. Important moments in history captured and frozen through a lens, beautiful places painted with the aid of light and technology and, important individuals whose faces have not aged a day older in their photographs. Learning the art of photography takes more than good equipment and a steady hand with a camera. You’ve got to have the artist’s keen eye for something different, something wonderful and with a click, boom, you’ve got magic. During the Illuminate photography workshop organized by the The Silver Lining, I learned about photography’s complicated technical nomenclature, the significance of different points of view when photographing, and the critical importance of light. Unyielding rain poured down that Monday afternoon and the team behind the Illuminate workshop didn’t expect any of the attendees to turn up. Lo and behold, there were about seven participants who were able to make it to the workshop, held at Fully Booked BGC’s The Forum. Most of the participants were art students, some already had professional experience and then there’s me, the shooting noob. Being an avid traveller and a photo enthusiast sans the talent for photography, I really wanted to learn more about this highly technical and tricky form of art. After a generous serving of lemon chicken and beef stew for lunch, the program resumed where it left off in the first half of the workshop. For many of us too lacking of skill to handle a camera, whether a handy point-and-shoot or a bulky SLR, the terminology and the technical settings can be quite daunting. 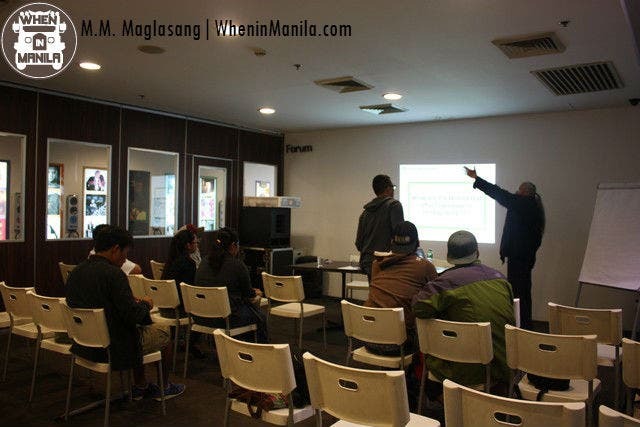 However, the workshop speakers, Michael Mariano and Edwin Celestino, both having years of experience and unquestionable talent under their belt, proved that photography doesn’t have to be as complicated as we like to think it is. Take it from someone who doesn’t know jack about aperture, ISO, shutter speed and whatnot, I was able to absorb some knowledge about camera work through the information that they ground and fed to us in understandable and uncomplicated bits. Sir Mike had us test the different White Balance modes. While listening to the lectures, I tried experimenting with the settings. They showed us many examples of their work and some photographs to display how different settings can make for a totally different work of art or photo despite that photo having the same content. Sir Edwin also reiterated on the importance of measurements in the settings, especially natural light, which is the one setting we do not have control over. Some of the photos were also quirky “I spy with my little eye, what do you spy” material. That’s the beauty of photography, you can capture something that’s just lying there but when you capture it with an artistic point of view, you have a whole different picture. Although photography’s terms can be learned through constant experimenting and reading, the “artistic perspective” as they say can only be achieved through constant photographing. The only way to be really good as something is to invest time and effort into it, right? Every good photographer will tell you that it’s not about the equipment, or “pahabaan ng lens” (competition to show whose lenses are longer and bigger) but about the different way you see even the simplest things and how you’d like to let other people show you this unusual perspective. Mind you, these written words are not all my own but the product of an afternoon’s session worth of substantial photography information. Simply put, I greatly appreciated how they were able to take such complex facts and figures and explain them with such profound plainness. Aside from the gold mine of knowledge I tapped into, this workshop is also for the benefit of the children at East Avenue Hospital stricken with the big C, and for one Ms. Joan Ladines. Sir Edwin and Sir Mike hold workshops and more for other individuals interested to learn more about basic and advanced photography, video editing, and what have you. Each one of us got a certificate of participation. Pictures can say a thousand words. But with the perfect photograph that can move and inspire, you’ll get people saying more than a billion. Best Western Premier F1 Hotel Manila : The Fort’s First Luxury Hotel!